Seth Godin's posts, my own attempts to improve my work, teaching my Izannah Walker Workshop online class, emails from two artists, and reading The Handmade Marketplace by Kari Chapin prompted me to write this post of ways to improve as an artist. See the list above? This is not exhaustive. There are probably 10 to 1000 more ways that are just as important. Please comment at the end if you have a way to improve to share. As artists we can fall in love with our own work. After all, we nurtured it and birthed it. It's our baby. We're like the mama with the cross-eyed child. We don't see the crossed eyes - we see the child. We don't notice the child's eyes are crossed until she walks into porch posts. (True story - I had a lazy eye as a child and had an operation when I was 5 to correct it). 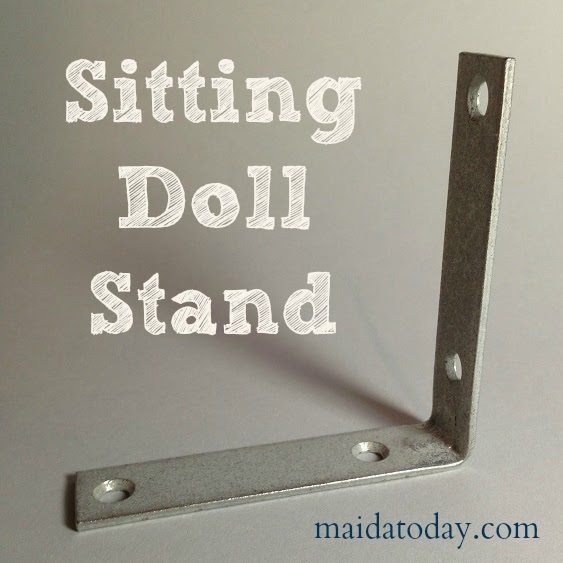 If your work is walking into porch posts, then maybe you need to honestly ask why. Sometimes we're not able to see the why ourselves. We need an outside opinion. How to get an honest outside opinion? This is tricky. Sometimes artist's online groups can do this, but I think people are cautious about typing up opinions of others' work and that becoming viral. Most online forums lean more toward an encouragement mode. So how can you get honest (but kind!) feedback about your work? First of all, ask for it. If you really want honest feedback, be ready to receive it. And maybe pay and work for it. Travel to get it in person. And if you ask for feedback, receive it with grace. The other person is giving you a tremendous gift by really looking at your work. It's a risk on their part. Step outside of your usual artistic arena. If you're a painter, try sewing. If you're a quilter, try paper collage. 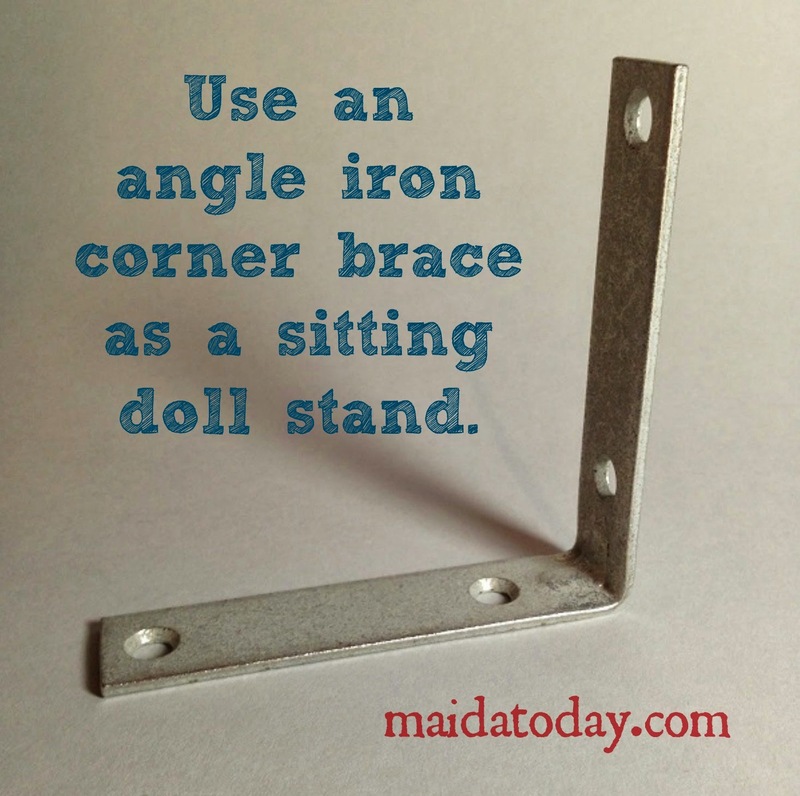 If you're a doll maker, try printmaking. It will give you skills and a viewpoint to apply to present work. It's important to make works that are totally experimental. If you feel that you have to sell every little thing you make you will start to gear your creations to what you think will sell. This can cause you to avoid making mistakes which sometimes lead to discovering new techniques. This is tricky. You have to approach it with honesty to understand why someone else's work is selling for $400 and your work sells for much less. There can be lots of reasons for this, and sometimes it might have nothing to do with the artwork. Usually I find it's because someone has really pushed to learn something that I have been lazy about. Sometimes it's because they've been at it longer and are better at marketing. But most of the time it's because they've put loads and loads of hours into honing their work. I remember once asking an artist dollmaker how she got her paperclay so smooth. I thought she had a secret paperclay smoothing tool that she could give me the link to. Guess what? Her secret tool was that she carefully fills all the little pockmarks by hand, sands afterwards, fills again, sands again....her secret is hard work, and not being satisfied with pockmarks. From a selling point, if everyone is making blue potholders and you make a blue pot holder it's going to languish in the sea of blue pot holders. How can you make a pot holder with a different spin than the hundred out there already? As in don't copy it. Once I made a creation that sold for $200. "Whoo-hoo!" I said. I was so excited, even though I had put 70 hours of work into it. The next week someone listed a creation with the same hallmark features and practically the same copy in their listing description. If others' work is selling high, and your work is similar, give them a mental high five if they do well. There are all kinds of forces at work that affect the pricing and selling point of works of art. Looking at what sells high will tempt you to do a copy of that particular work. And it won't have the same spirit, because it will read like a photocopy of a photocopy. Don't do it. This relates to trying something new. Look at work outside your discipline. If you're a painter, look at a doll show. If you're a sculptor, go to a film festival. Broaden your horizons. If you're weak in an area you can improve. Not a good sculptor? Take a class in that. Need help with sewing? Buy a sewing book. Improve the areas in your work that stick out in a bad way. On the other hand, you don't want to have a lot of strong weaknesses. I've found that painting can cover a multitude of sculpting sins. Or vice versa. Play to your strengths in what you create. If you choose to do things you love, chances are you will get better at it, because you will enjoy doing it and put the time in to improve. If you hate something, that's what will come through. If you hate painting but love sewing fabric then what kinds of creative areas will be your best fit? Quilting and fabric arts come to mind. If you hate sewing but love gluing then maybe you will make paper quilts. Making what you love will give your work a kind of joy that will be irresistible to people. Well, that's what's on my mind very early on a Sunday morning. Doll Shops United, a site dedicated to selling dolls and doll related items, will be having their Grand Opening on November 15th. 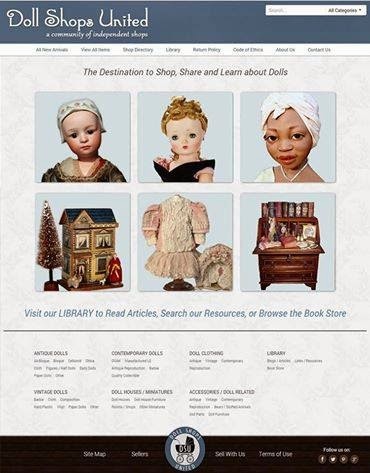 Doll collectors, dealers and doll artists will have a new opportunity for buying and selling dolls. You can check out their preview site here: Doll Shops United Preview Site. You can rent a shop for a whole month at a flat fee which allows you to showcase multiple items instead of paying Ebay commissions per item. 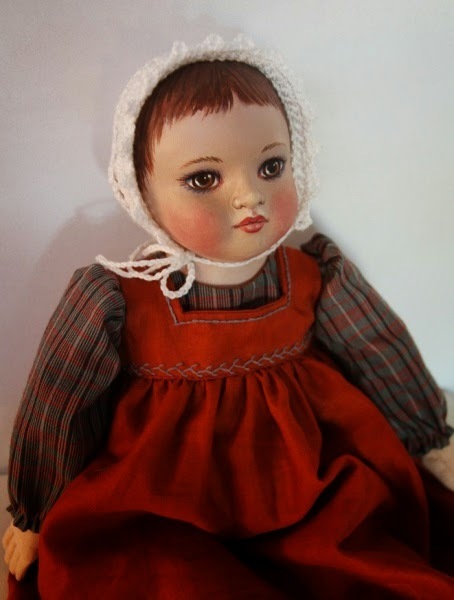 I sold an antique doll on Ebay last year and the commission for that ONE doll was would have paid for a shop for a month at Doll Shops United. Doll Shops United has two tiers for membership - a standard shop and a featured shop. You can read more at the Sellers FAQ page. The Doll Shops United Newsletter will share updates as the date of the Grand Opening nears. The Doll Shops United Facebook page has daily information about the site and images of beautiful antique and contemporary dolls. To see more images of Sethany Fairchild, visit this photo album. 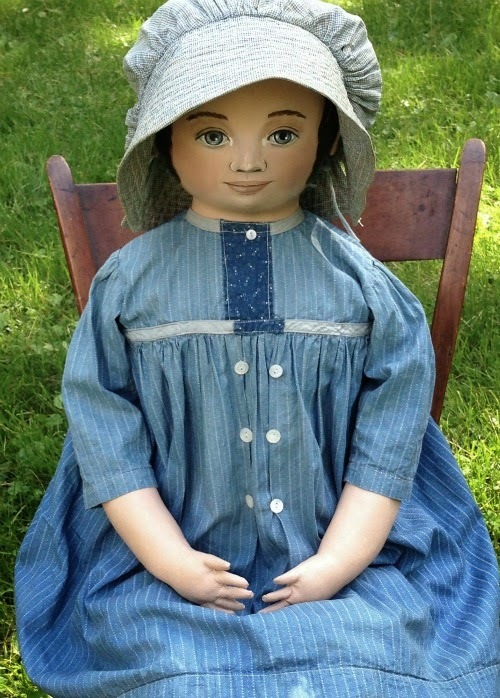 Not long ago, I (Dixie) was lucky to purchase a Helen Pringle doll to add to my study collection for a while. 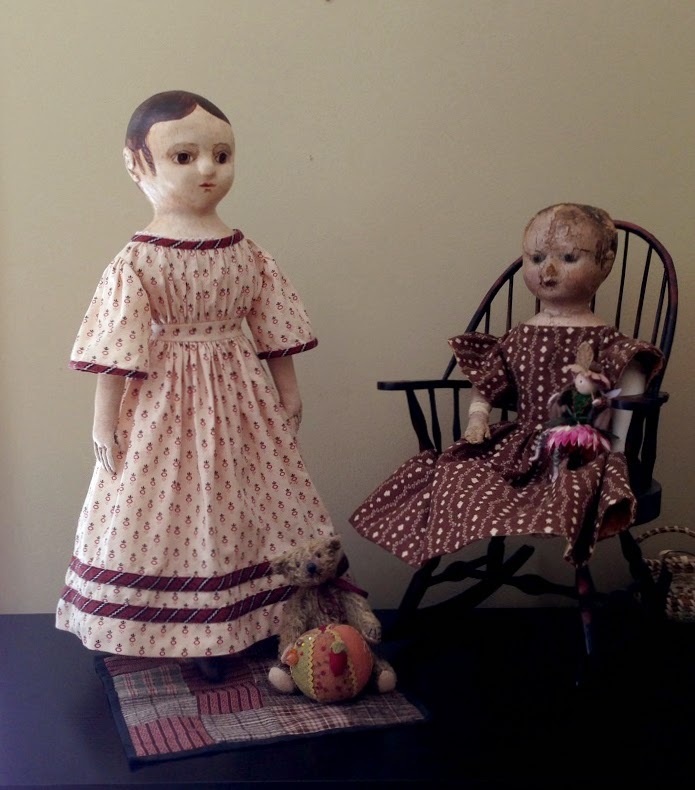 Most doll groups that focus on making vintage and antique dolls will eventually discuss Helen Pringle’s work. 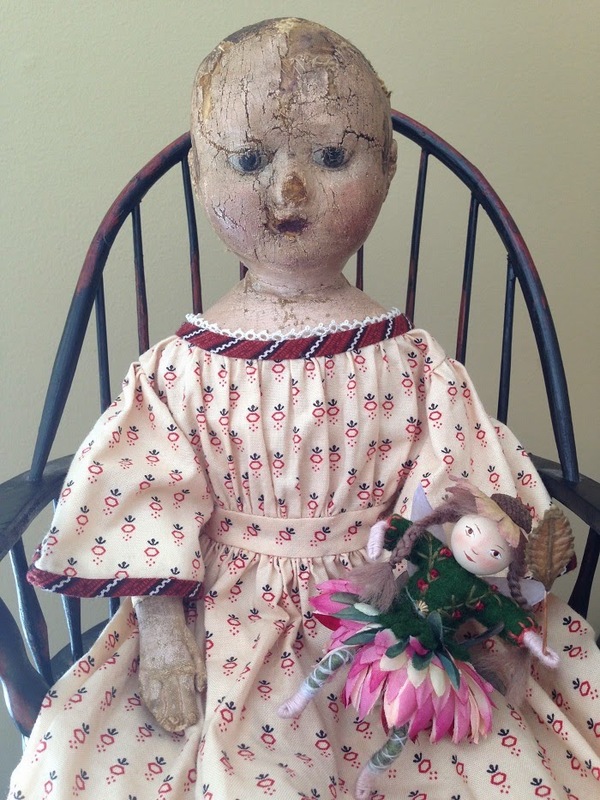 Her creations have the appeal of antique dolls, something many of us try to capture. 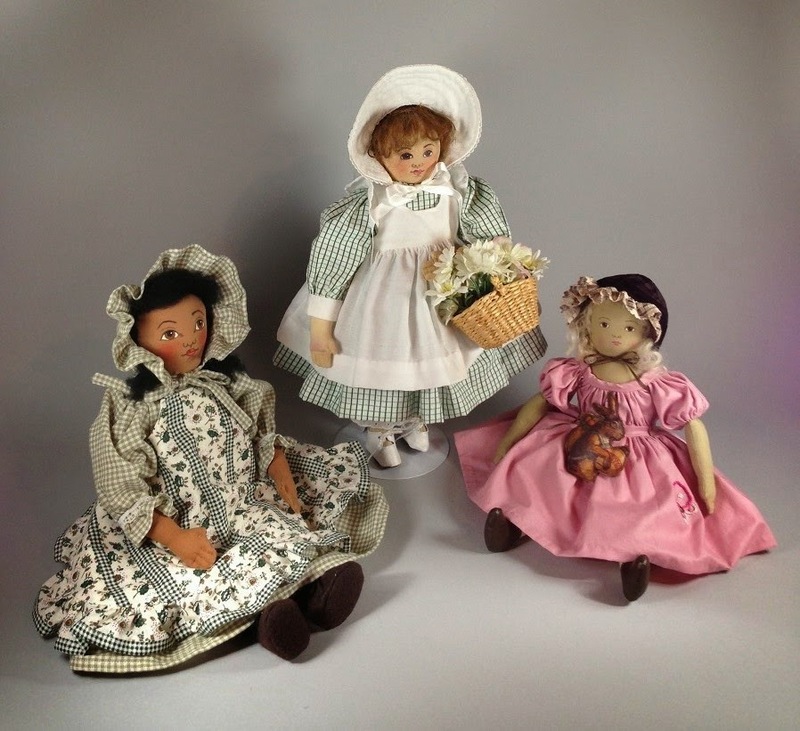 Helen’s work is highly collectible for those who love cloth dolls. 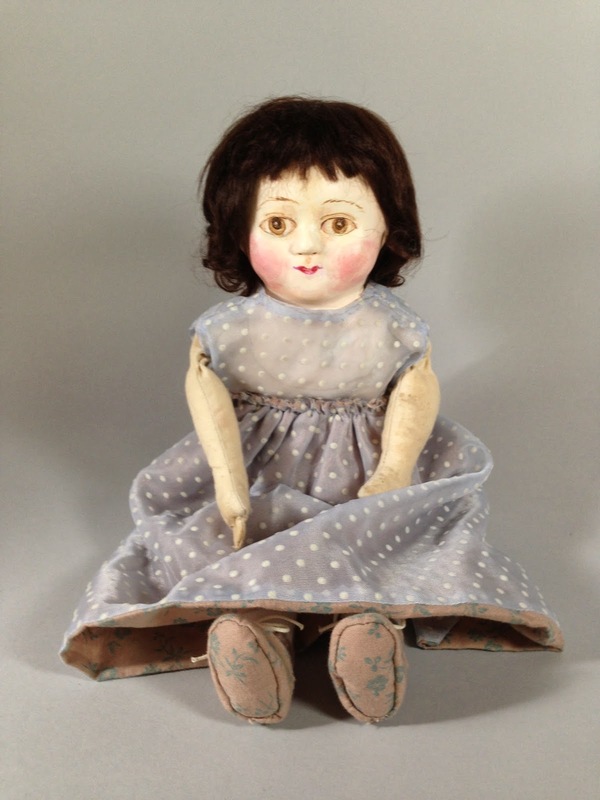 In studying this doll, I had the chance to ask Helen some questions about the doll Sethany Fairchild (pictured) and her other artistic creations. She graciously answered them. What inspired you to make antique inspired dolls? How did you decide to sell them? 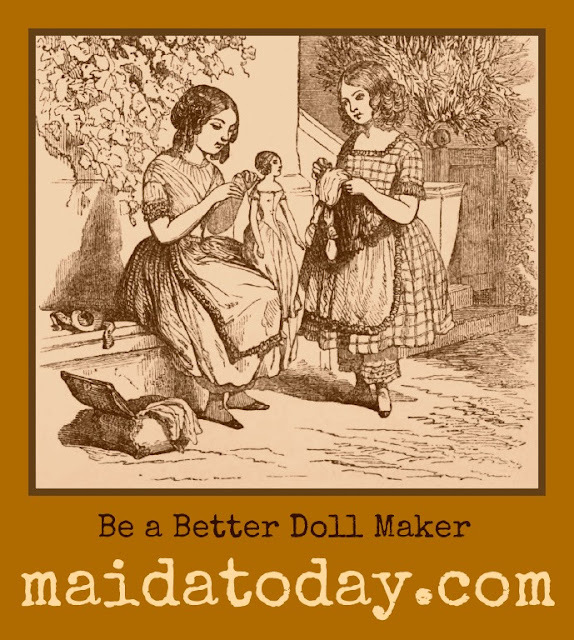 My mother, aunts and grandmother were seamstresses and my sister and I learned to sew as girls. I remember an apron I made in 4-H, and learning to embroider as a child. Around 1980 I met Elizabeth Patton, a fellow antique collector who moved from Houston to Fort Worth. She was a doll collector of mostly big papier maches and had done repair for a doll shop in Houston. 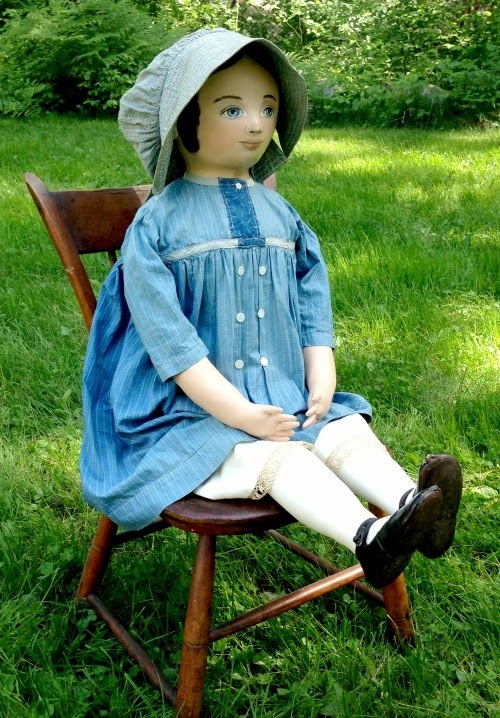 Sitting in a child's chair in Elizabeth’s house was a huge cloth doll in children's clothing - she was mind-boggling. 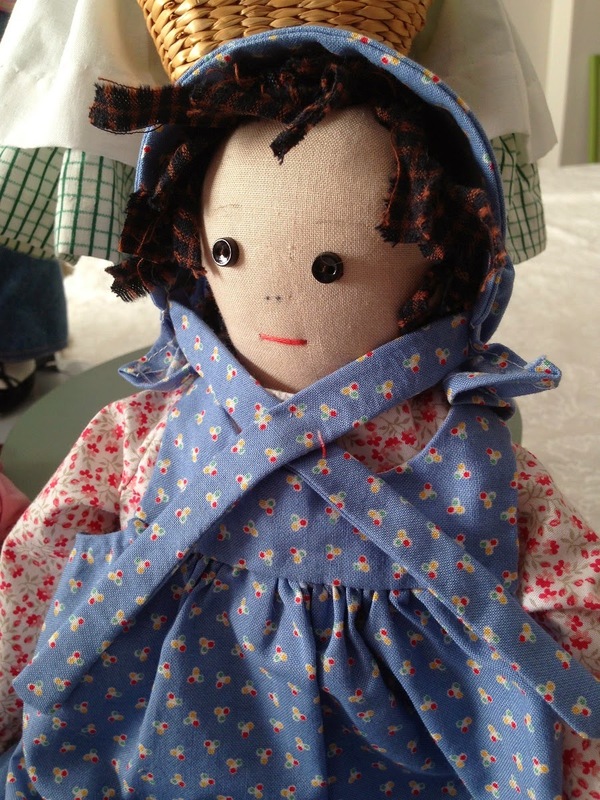 When Elizabeth told me she had made the doll, I could hardly believe it, and asked her if she ever shared her pattern. Not yet, she said. She had devised the pattern from a large doll she had repaired, she told me. Several years later, she sold me her pattern, reserving the right to make her own dolls still, though I don't think she ever did. (In fact, she later had me to make her three, 36" black girl and black boy and 26" white girl.) Soon in the mail came a flat envelope containing odd pieces of grocery sack, which I finally figured out was the pattern, without instructions. Naturally, I began to tinker with it, and my first efforts at painting were pretty crude, as I am a left-brain person and not at all artistic. I had made stuffed toys for my children, so I didn't have to learn that. I don't remember if Elizabeth had an undercoating, or if she used acrylics or oils, but the Miracle Messy Mixture was my own undercoating for the head, shoulders and arms. (See the recipe for Miracle Messy Mixture here). 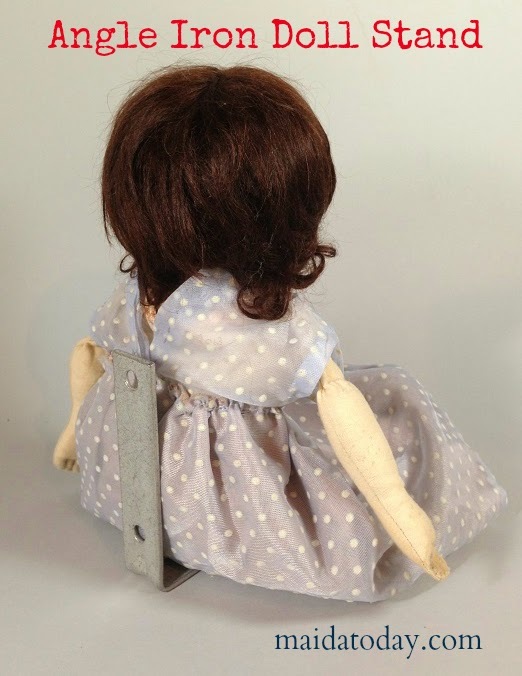 One of the first dolls I made was a 36" girl for Dolly Johnson (Dolly FairChild) in 1983, and then people began to order them. 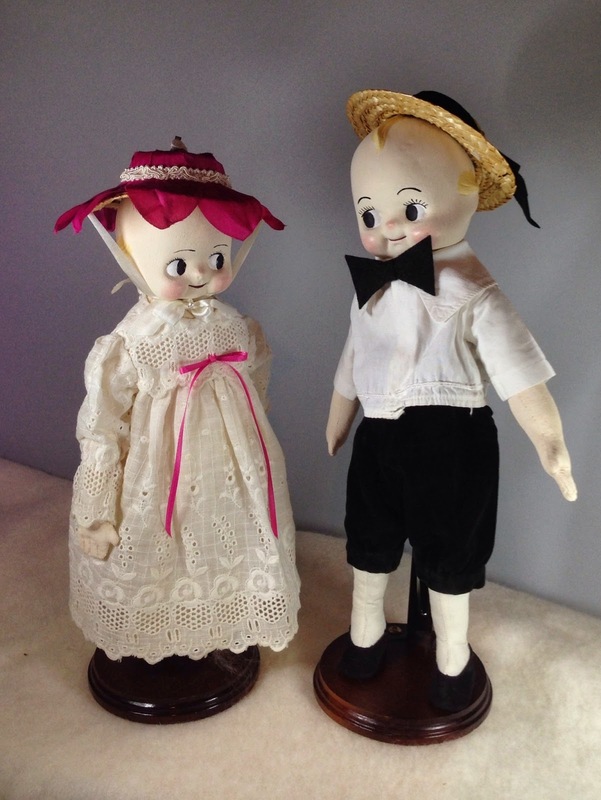 This is a chicken or egg question: Did your interest in dolls grow out of your love for antiques or did your love of antique dolls lead you to love antiques? I was an antique collector long before and not a doll collector. Rug hooking also preceded dolls, as that began in 1978. I was never, and am not to this day, interested in "fine dolls" of bisque, French bebes, etc., though did come to like early small chinas, cloth, wood, and small papier maches. I am in awe of Edyth's stunning collection. FairChildren were made in 36” and 26” sizes. They wore actual children's vintage clothes and shoes, or dresses in documentary prints or old fabric made especially for them. 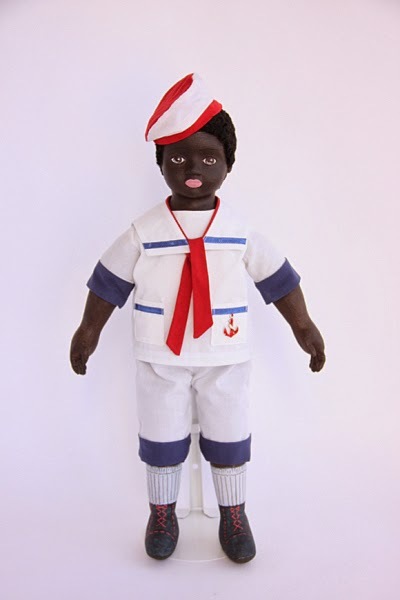 There were boy and girl and black and white versions of these dolls. Helen numbered the larger dolls. For years Helen included some antique piece with each, jewelry/handbag for the girls, pin/toy for the boys, until it became too expensive. The 36" dolls had one bag of stuffing in the head and 2-1/2 to 3 in the rest of the doll. The head pieces are double-stitched because of the large amount of stuffing needed to obtain the rounded shape. Helen mentions that on special request, she made one baby in these dolls. Helen thinks she may have made up to 90 Fairchildren dolls. Sethany, pictured above, is No. 58. The Maids and Lads were 21” in height. They were made for a Harvest Festival show at the Essex Museum (now the Peabody-Essex) in Salem, Mass. They were small versions of the big Fairchildren dolls. Their clothing and shoes were new, but in old styles. Tansy-Tabby was made for a class Helen taught at a Doll Seminar in Utah, measuring 10-12” in height. She was a small project to teach oil painting a doll in an easily portable unit. Helen loves old topsys and has several in her collection of antique textiles. At one time Helen offered a pattern of Tansy/Tabby. Helen also made one-of-a-kind cloth dolls occasionally - Emily Morgan, The Yellow Rose of Texas, Nizhoni, Navajo girl with moccasins made from old leather gloves and real turquoise jewelry. Nizhoni is the Navajo word for beautiful. Helen tried her hand at Sculpey and made several dolls of it. She says it was wonderful fun. 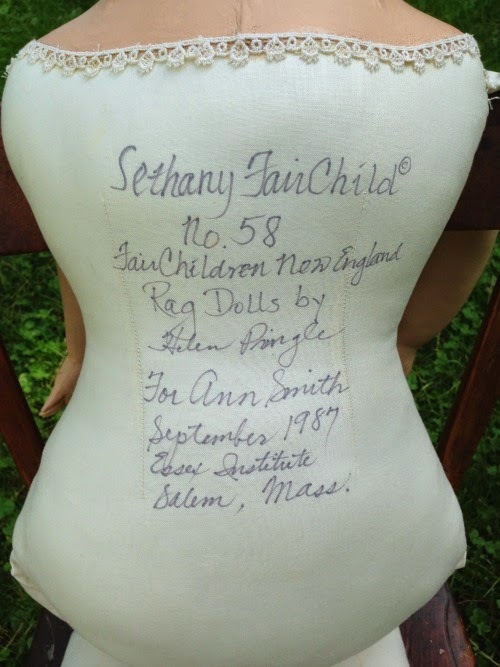 For her niece's collection,Helen made a tiny replica of Hitty, just a little bigger than the real Hitty (made of wood) dressing her in a petticoat with her name cross-stitched on the front just like the original Hitty. All these one of a kind dolls were finish-painted with oils. For someone who describes herself as “not at all artistic”, Helen created a large body of three dimensional works, reminiscent of folk dolls of the past. 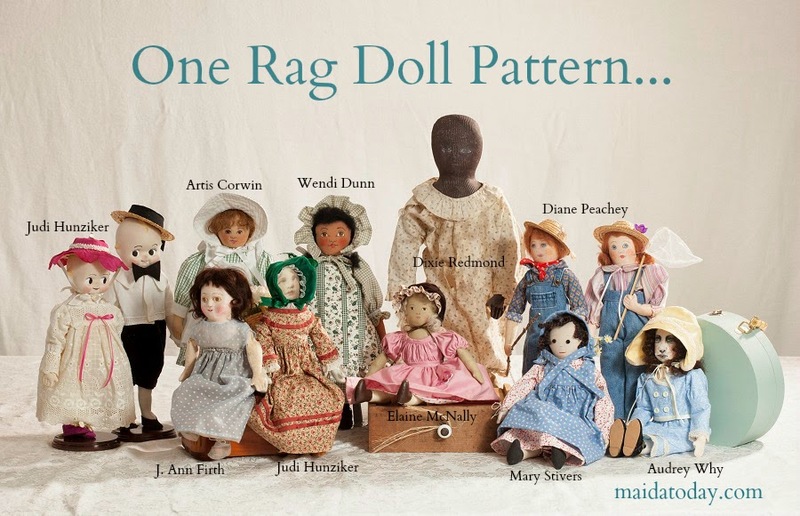 Helen’s dolls are beloved by doll makers and collectors alike. 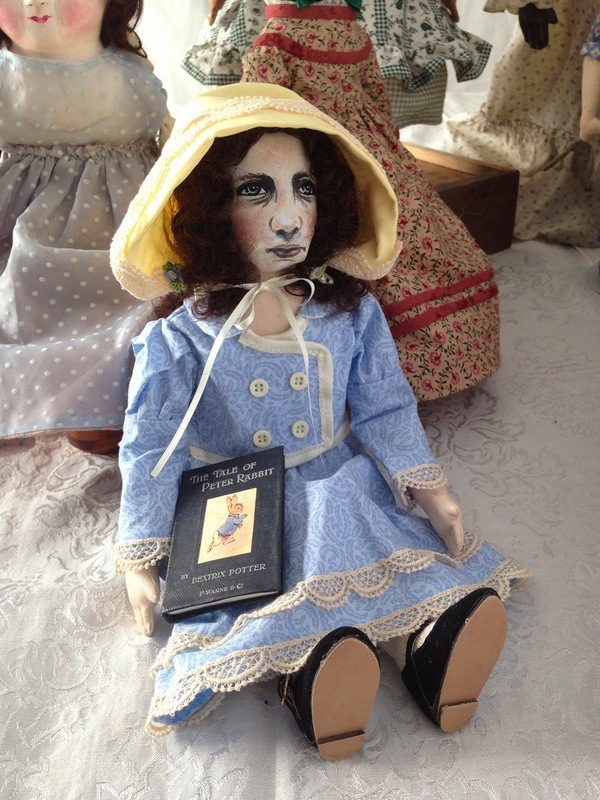 Doll makers inspired by antiques want to emulate the spirit that Helen captured in her work. This nice early German glass eyed Papier Mache’ head with a snood hairdo once had a Motschmann type body. 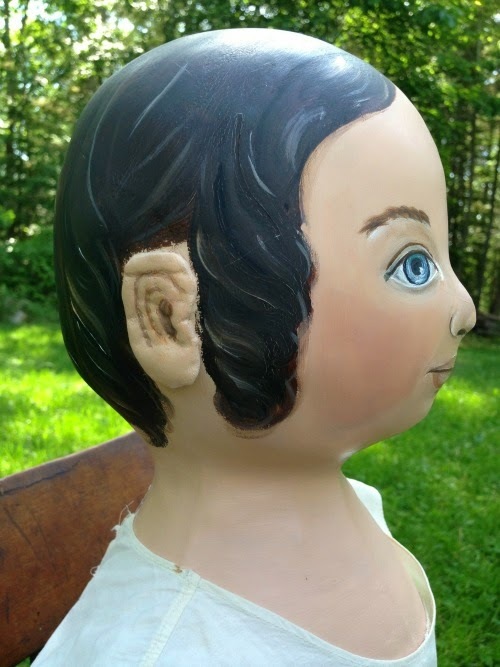 Pictured also is a blond waxed doll of this period on her original body. I will watch for a correct old body, and may or may not ever get it. There was a broken Motschmann for sale just this week on line, but too small to go with this head. 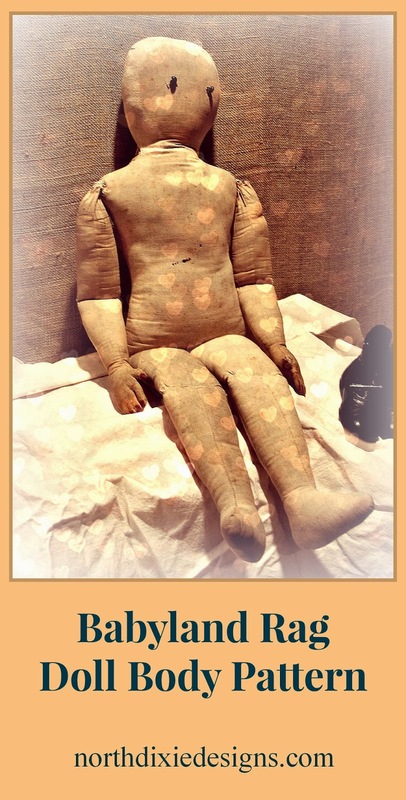 Meanwhile, I have placed the doll on an old cloth body and added arms from a wax doll of 1870 to 80. This way she can be dressed and enjoyed with the doll family. 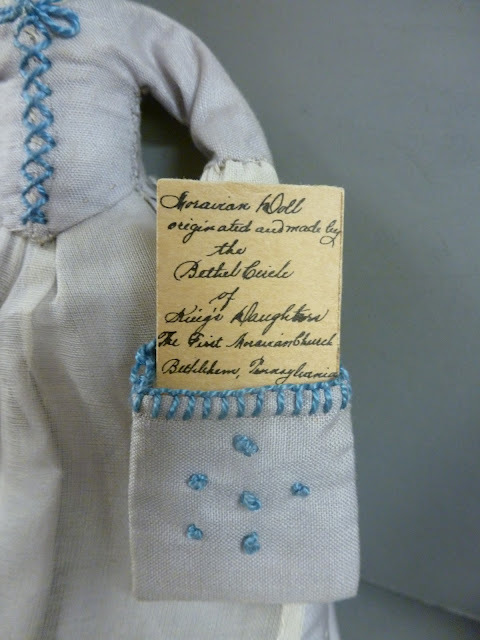 The mid 19th century under clothes of little girls and their dolls are so sweet. How nice it is to find an old doll dress just right for her. 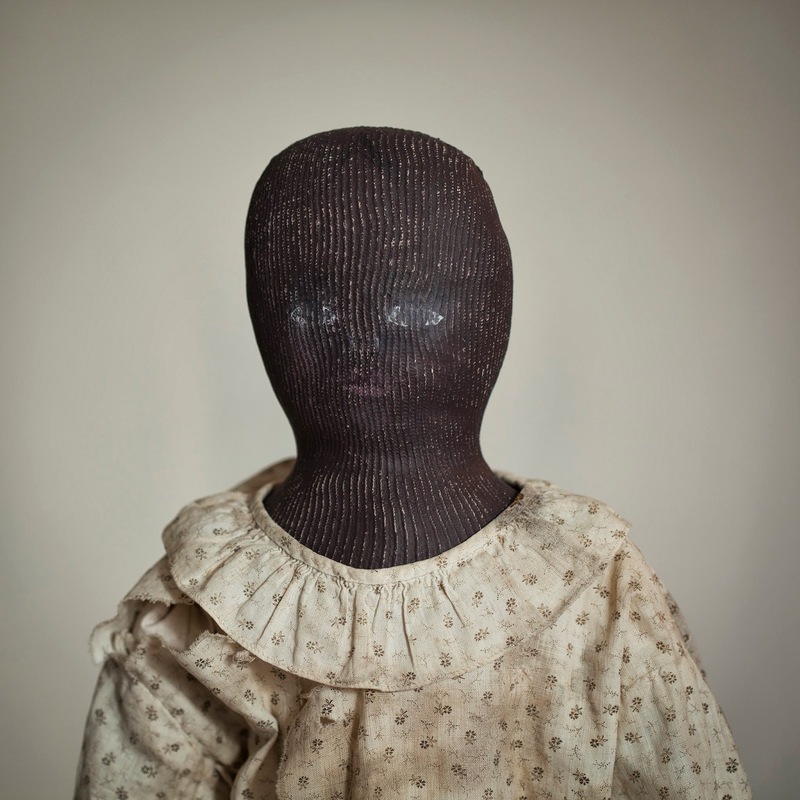 I believe this doll head with a snood was made about 1860. 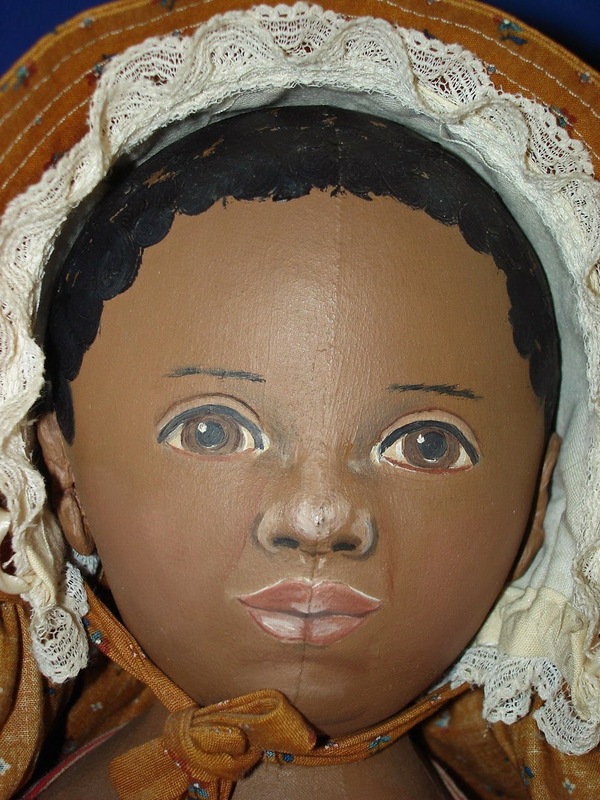 Most dolls I have seen of this type were waxed, but there is no residue of wax on this head even in the smallest crevasses. She is seldom found in this large size. As shown she stands 22 inches tall with child like proportions and would look correct on a slightly longer body. Although she shows wear to her head this is preferable to restoration when wear is minor like this. Her personality is intact . Lucy's Doll House will be closing its doors after October 12th of 2014. 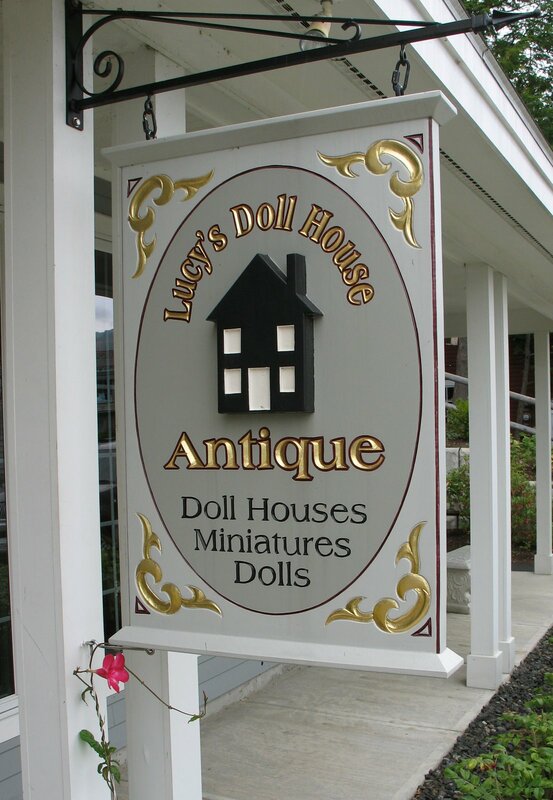 Lucy's Dollhouse began in Camden, Maine in 2006 with Lucy Morgan and Susan Singer as the proprietors. 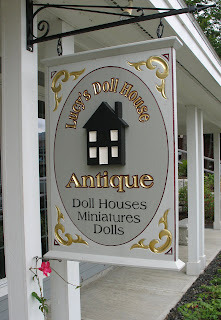 Over the past 8 years the shop has been an inspiration to me, Dixie, as an appreciator of antiques and as a doll artist. Sue graciously allowed me to document many Izannah Walker dolls which came through their shop. From those photographs, the Izannah Walker Chronicles was born. The shop will be open Wednesdays through Saturdays from 10-4 until Labor Day. Following Labor Day the shop will be open Fridays and Saturdays from 10-4 until October 12th. While the physical brick and mortar shop of Lucy's Dollhouse will close, Sue Singer is looking forward to opening an online shop called Gazie's Dollhouse. 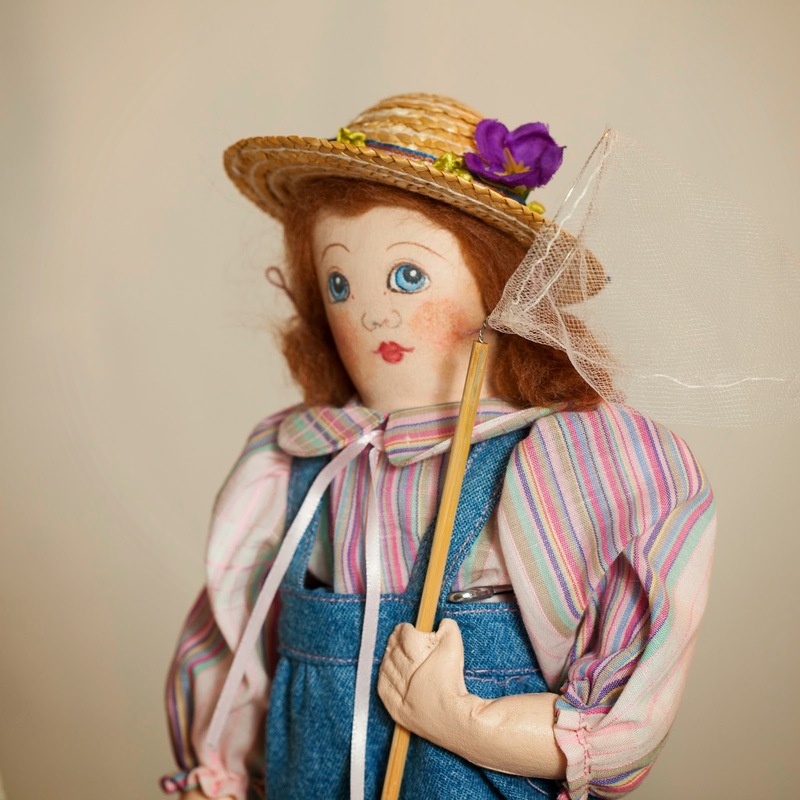 When most people mention antique Moravian Dolls, we are accustomed to thinking of Polly Heckwelder dolls, such as this one sold at Morphy's Auctions. On a visit to Lucy's Doll House, I saw this collection of little dolls, also made by the Moravians. These tiny dolls are about 4.5 to 5 inches tall and were "named Benigna, after the founder of the first Protestant boarding school for girls in America" (Cloth Dolls From Ancient to Modern, p. 27). In this case, some of the dolls come with a little pocket which holds a card describing the doll and the project they were being sold to help with. 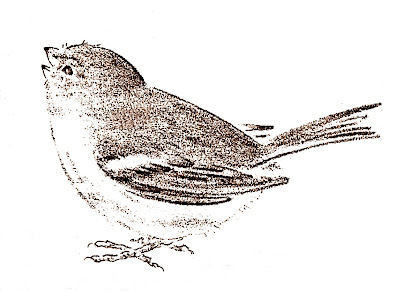 but provenance to a creation like this. 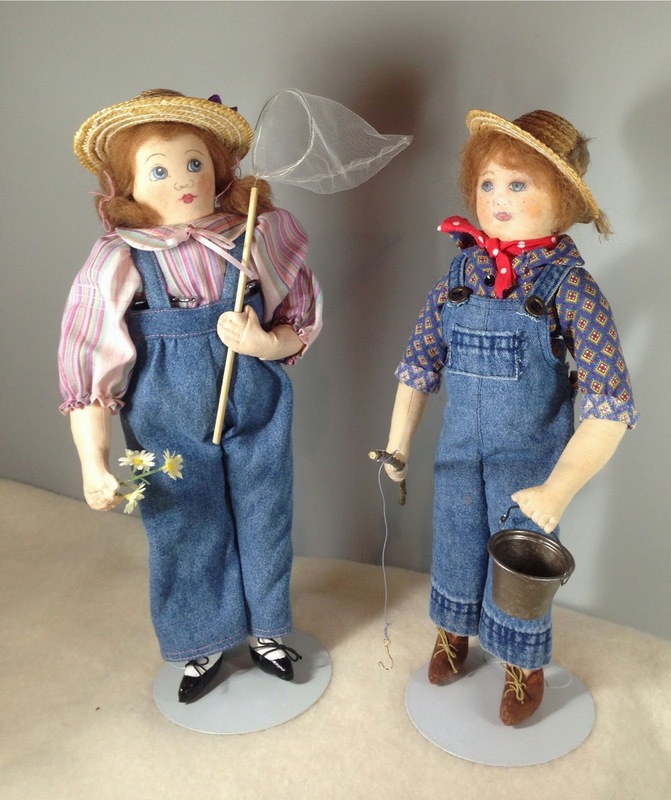 for the opportunity to share these charming dolls. People often ask me if I will make additional dresses for dolls they purchase from me. Making dolls is my focus, not making doll clothing. I have my own undressed dolls which need help as well! Recently I saw a reproduction dress made by Carol McDaniel on Ebay. I bought the dress and tried it on a doll made from my pattern, at left below. It was a perfect fit. For fun, I tried the dress on my antique Izannah Walker doll, and except for the length of sleeves and skirt, it was workable. So I emailed Carol, asking if she could make a dress with a specific length of skirt and sleeve. She replied that she does custom work. So....if you have dolls to dress, and like the style dress above, contact Carol about making a custom dress for your doll. Carol also sells ready-made dresses for dolls on Ebay. 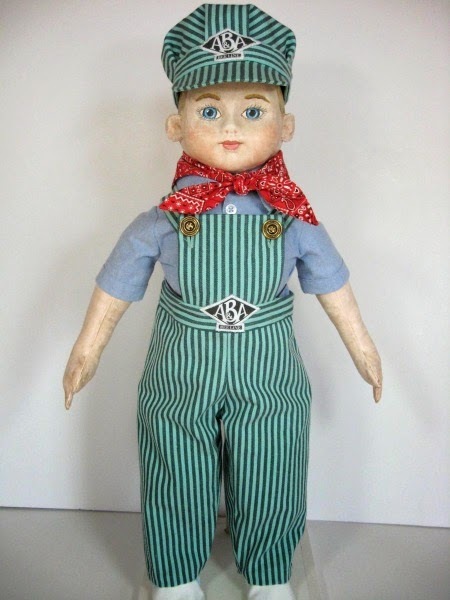 The MAIDA Dolls Group will be doing an Alabama Baby inspired doll challenge in early 2014, so I am saving images. 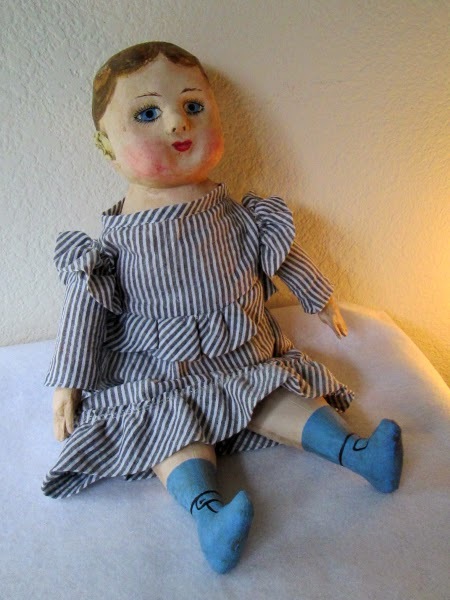 "SHE IS A ANTIQUE, (FADED)MARKED: "PATENTED SEPT. 26,1905", ELLA SMITH, 20" ALABAMA BABY, INDESTRUCTIBLE CHILD CLOTH DOLL. SHE WAS MAKE IN ROANOKE, ALABAMA. SHE WAS DISPLAYED AT THE STRONG MUSEUM IN ROCHESTER N.Y. I BOUGHT HER AT A HIGH END AUCTION WHERE THEY WERE AUCTIONING OFF DOLLS FROM THE STRONG MUSEUM. SHE IS IN VERY GOOD TO EXCELLENT CONDITION. SHE HAS A NOSE AND A RIGHT CHEEK RUB. THERE IS SOME CRAZING TO HER FACE AND PAINT LOSS OVER THE 100 PLUS YEARS. SHE IS WEARING HER ORIGINAL DRESS AND BLOOMERS. SHE HAS PAINTED BLACK HAIR AND BROWN EYES.SHE HAS THE MOST WONDERFUL PAINTED ON BLUE BOOTS!"